There’s one major problem with this setup and that’s power. You can’t (easily) drive charging and USB at the same time and the load on the USB and CPU due to the DisplayLink solution pushes down the battery life. 20% battery per hour means you’ll only get a maximum 5 hours out of this solution before you have to charge again. This is one of the reasons that many of the 10-inch Windows tablet solutions are more flexible than the 8-inch solutions. For example the Lenovo Miix 2 10 has both USB and charging ports. Despite that limitation this is still an impressive demonstration of the flexibility of cheap Windows 8 solutions and remember that they go down to $100 now, which is less than the docking solution used here. In terms of performance there are also some limits to watch out for. Three Windows 8 Modern / Store apps work OK but if you start to add desktop apps it runs out of memory and starts using Pagefile.sys which is absolutely kills the performance to the point where you’ll want to throw it out of the nearest Window. 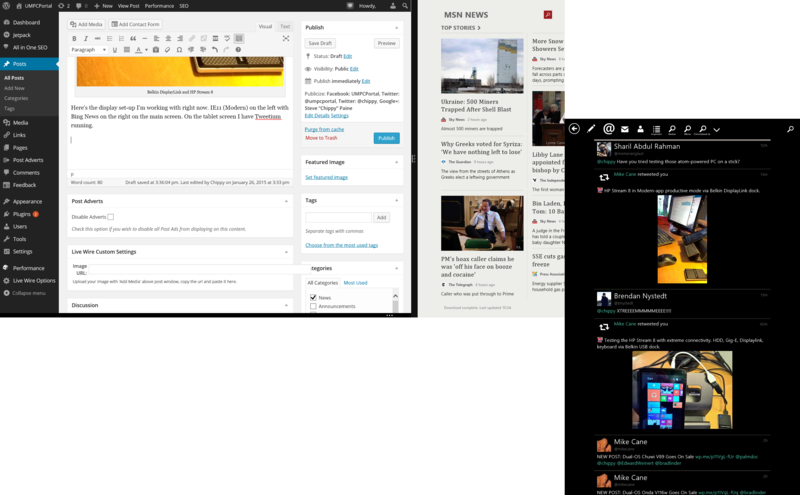 For a tweet or news-wall, a single Web app, a 1080p video or gallery it works well, until the battery runs out. The video performance isn’t perfect either. HDMI is always better than a USB solution. It’s OK for writing, but not for video playback. Let’s look forward to the Toshiba Click Mini has 2GB RAM, two USB ports and a HDMI port. More expensive, but a better entry-level solution for this sort of flexibility. Bring on the C port already. At least there a couple of pins can be re-purposed to carry displayport traffic. I don’t understand; aren’t there adapters available that let you charge AND use a USB device/hub? 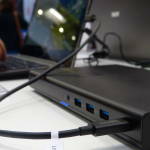 Dell themselves sells one for the Venue 8 Pro. Plugable’s UD-PRO8 is awesome. 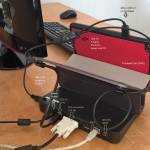 Works great with my Venue 8 Pro, full Ethernet, video, four USB ports and charges my V8P. I can’t see any downsides so far. Easy to install, only one glitch, the DisplayLink driver my need to be upgraded. Look forward to seeing your experience. The downside to the Venue 8 Pro/Pluggable set up is that video playback can be choppy when playing it full screen. Give me a 5.5-6″ phone with the Atom processor, 4gb of ram, 256gb storage and that USB 3.1 C connector with full Windows 10, use a dock like that with charging and USB 3, maybe a MSATA SSD socket, and Microsoft would have a winner. Forget the mini tablets. 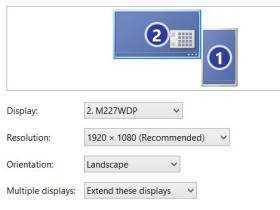 I read at the weekend that desktop will be disabled on Win 10 devices under 8-inches. Let’s hope it’s just a software switch. Such charge + USB hub dock would be sweet to have with Asus T100TA too… I was thinking of using it for desktop stuff a bit, but the need to plug in HDMI, USB hub (for mice, keyboard, and external storage) and charging cable makes it a bit unatractive. Too bad these things don’t use the Dock Port connector. at least somebody shows that what industry and the whole bunch of so called gurus and experts try the public to tell to be impossible to do with theses devices actually works out astonishingly well. thanks for the effort. that so called desktop applications have memory problems since win 7 – problems they actually did NOT have under win xp – makes one suspicious that there are some quirks implemented on purpose and by design to force metro. e.g. take the simple fact that under xp the same firefox browser is able to run about 3 times more open tabs than under modern windows. this must poeple make scratch their heads. Chippy, you have a great idea but you selected the wrong tablet for your demonstration. If you and your readers want to use a tablet as a light duty desktop replacement then purchase a Winbook TW700, TW800, or TW100 series tablet from Microcenter (in my case Winbook TW801). The Winbook TW801 includes a Baytrail-TZ3735D Quad-Core 1.33GHz Intel processor, 2GB of DDR3 RAM (not just 1GB like the HP Steam series), 32GB eMMC on board memory, a micro USB OTG/charge port, FULL size USB 3.0 port (yes 3.0), micro SD card slot supporting up to 128GB cards, a micro HDMI port, Bluetooth, and wireless N. The price for the TW801 is $119.99 in store. I have directly connected my TW801 via an INSTEN HDMI-F to Micro HDMI-M Adapter ($1.89) to 24”(720p) and 52” (1080p) Sony LCD TVs, a 32” Samsung LCD TV (1080p), and a Dell 2408WFP monitor (1920×1080 res). In all cases the desktop icons look excellent in mirror or extended screen modes. 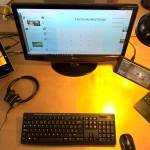 I have tried numerous USB, wireless, and Bluetooth keyboard and mouse combos and all work perfectly and were instantly recognized by Windows 8.1. I have successfully connected to a 65” Samsung LCD at 1080p resolution wirelessly via WiDi (Miracast) using a Microsoft Miracast Adapter connected to the TV. Winbook does not specifically mention Miracast built in support but it worked great with minimal lag. It is fair to note that the TW801 was not able to connect to my Samsung 32” with Samsung’s built in AllShare WiFi connection (I had the same connection problem with a Dell Venue Pro 8). The Winbook TW801 unfortunately does not have dual-band WiFi support and seems to have difficulty automatically switching to a stronger WiFi signal when one is available. With all the built in ports the Winbook TW801 has exceeded my expectations and is an awesome and inexpensive light duty desktop replacement alternative that can connect to USB and Bluetooth devices, HDMI or Miracast enabled external displays, and be charging all at once. 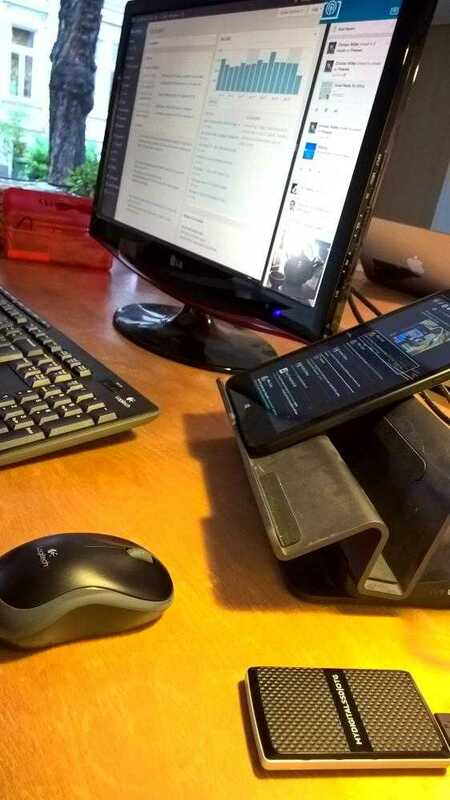 No need to spend $150 on an 8” HP Steam or Dell Venue Pro 8 and another $89 for a Plugable Pro8 dock. The Winbook also includes a licensed version of Windows 8.1 and a 1 year subscription to Office 365. For a truly inexpensive solution check out the Winbook TW700 at $59.99, it has less memory but still has the full complement of ports although the FULL size USB is 2.0. Agree 100% with Axmir. My Winbook TW801 is absolutely awesome. 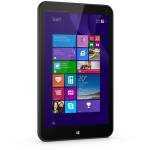 So unreal flexible and for $ 119.00 you just will not find a better 8 inch tablet for the price. Microcenter nailed it on the TW801. Runs great right out of the box, and with very, very little effort can truly become like a decent little desktop replacement for casual tasks. Yes there are better tablets for this demo. I’ve previously done demos (this isn’t the first article i’ve done on the subject) with the Miix 2 10 and Acer W4 which both have 2GB and HDMI. My daughter regularly uses the Miix 2 10 with Office on a big screen for her homework. As mentioned, Dell came out with a charge & sync cable a while ago for the Venue. Works very well. I throw that in with a powered hub and a Pluggable VGA adapter and I have a spare PC when I travel to a remote office. This is a bit more portable and general purpose (as you have the hub to use for other things) than the dock solution. I have to say that “the new Dell” is surprising me. They sent a replacement Stylus without any request from me when they realized version one was a dog; and came out with this adapter after no doubt paying attention to what people wanted. Quite different than my experience with my last Laptop from the other guys. Not sure how safe those simultaneous data and charge cables are like the one from Pluggable. From my understanding, it tries to force a voltage on the power pin while the tablet is in USB host mode without going through the steps outlined in the USB spec to reverse the power direction. Also, I doubt any tablets out right now do support reversing the power per the USB spec anyway. 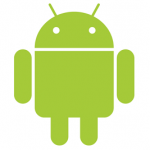 It’s certainly possible to damage your tablet with these devices. It may not be catastrophic but the minor damage each time could reduce the lifespan of your device or cause unexplainable behavior (touch issues, BSODs and etc. ).